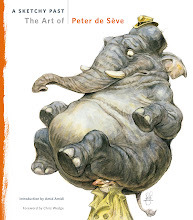 A Sketchy Past, The Art of Peter de Sève: "Easy being green, it is not." "Easy being green, it is not." I'll confess right here that I grew up a Star Trek fan and if you let me, could bore you with an endless stream of Trek trivia that would make you squirm with embarrassment. Hell, it would make me squirm with embarrassment, but it's my gift and my curse, I guess. That said, I did enjoy the Star Wars films. Well the first two, anyway. Especially The Empire Strikes Back, which is one of the best science fiction action adventures ever filmed. (Really though, have there been that many?) Anyway, I was invited to be a part of Star Wars, Visions, a truly wonderful collection of Star Wars images created by a wide variety of artists from many genres. No art direction was given whatsoever and the artist was left free to create whatever homage, reinterpretation or visual joke he or she felt inspired to do. Whenever I get an assignment, especially such a wide open one, I begin to free-associate and see what connections my frayed synapses can make. he would be good to draw... and he was actually a puppet, wasn't he? No, he was a muppet! And he was green, too. Wait a minute! Wasn't Kermit the frog a muppet, too? Wait! Wait! He was a GREEN muppet! And they both lived in swamps! What if they knew each other? What if they actually hung out together??!! Maybe I'll have a tuna sandwich..."
Enjoyed your train of thought too, haha. That would be a strange friendship, hilarious though! Great work! I can only imagine what their conversations will entail. Now that I have preschoolers... every time Grover comes on to the TV I hear Yoda. Both of whom are voiced by Frank Oz. Brilliant! Only one quibble: Yoda wouldn't use the contraction "isn't": Easy being green, it is not. Really really great, Peter! Always great to seeing your updates :D This art light up my day! Gin, you're absolutely right but I did get it right in the book! Yoda was voiced by Frank Oz, who also voiced Bert. Kermit was voiced by Jim Henson, who also voiced Ernie. So you see, they must be best friends! Oh, Peter, this is AWESOME! I love this for SO MANY reasons, least of which is I worked for and with both those little green guys! If they ever decide to make this available, PLEASE let me know...It represents 25 years of my career in one great painting! "It's a theory, Jim...it's possible." I can easily see this going viral. It is THAT good. My day just went from a 4 to a 10, thank-you Peter for being awesome. I really like how Muppet-y Yoda looks. Nice! I think it's very significant here that Frank Oz was the voice of Miss Piggy as well as the voice of Yoda. I need a print of this. So nice! This is just golden~ LOVE it! This is faultless - I can't stop staring at it! 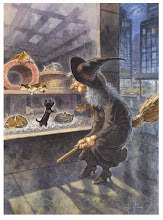 I'd love to see more of your character interpretations (and some process images of one of your watercolour pieces, pretty please?). hahahahahahahaha ! I love the process. Hahahaha, a Tuna sandwich :-). Whatever you draw, it is always automatically a classic. Bravo ! Since it is part of a book, probably not... but just in case... Any chance of getting a print? Aww. They're Jim Henson and Frank Oz. Fantastic piece, and a wonderful honor to be asked to be a part of the book. wouldn't be suprised if this one makes it's way onto the Sky-ranch halls...makes me smile. Is that poster for sale? I'd love to have a copy. I'm a big Muppets/Star Wars character fan. Just some of the Star War characters. Love when the Muppets are the Star Wars characters. Ha, this is really charming, very cool to see these two chaps together! So great to meet you at the Brooklyn Museum yesterday, hope you had a great day! Great idea...except the tuna sandwich part. Bleh. I would LOVE to purchase a print of this!!!! Hi Peter, enjoy your trip to the CTN this week end!! I wish I could come!!! Thanks for including the thought process. Awesome! Hahahaha!!! What if you could've hung out with them?¿ Wouldnt THAT be awesome? How was the sandwich? Please let us know if there is ever going to be a print for this! this is just amazing :D I love your style... your whole blog... everything! 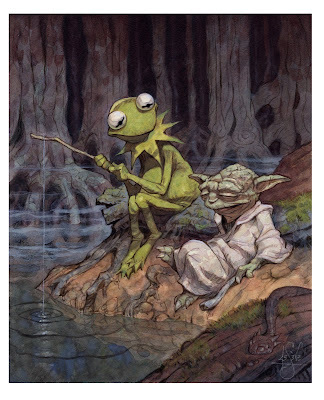 While I am embarassed to be checking out your blog after such a long hiatus, I actually felt rewarded when I saw your Kermit and Yoda conversation. They are two of my favorites and they look so good together. I love that you caught them relaxing in the swamp at the same time. I will be buying this book for this picture only. My favorite painting in the entire "Visions" book. Thanks for posting it. *gasp* I MUST have a print of this!!! I WOULD LOVE to have this on my wall, are you offering a print version? This is BRILLIANT!! My two favourite muppets! What incredible talent and imagination you have. And what a wonderful way you have with putting things. Very enjoyable. A week ago this past Friday I lost my father suddenly. He loved and deeply admired Jim Henson. Today is my first day back to work after his funeral. Finding this image brought a tear to my eye but a large smile too. I miss you dad. This is freakin' awesome dude! I'd like to jump on the "Please offer a print!" bandwagon. This is a wonderful illustration. Fantastic work! Definitely deserves a print. Make prints! I would LOVE this framed on the wall. Please?? Love your work and sense of whimsy. This would make an awesome t-shirt for us geeks. It's beautiful and full of wonder. I'd LOVE a print of this! I would also really love a print. My husband and I saw a canvas version that was - so sadly - very out of our price range. I would LOVE to be able to gift him a print version.